Another picture from our late afternoon walk at Long Hill. This was May 17 and everything was in bloom. 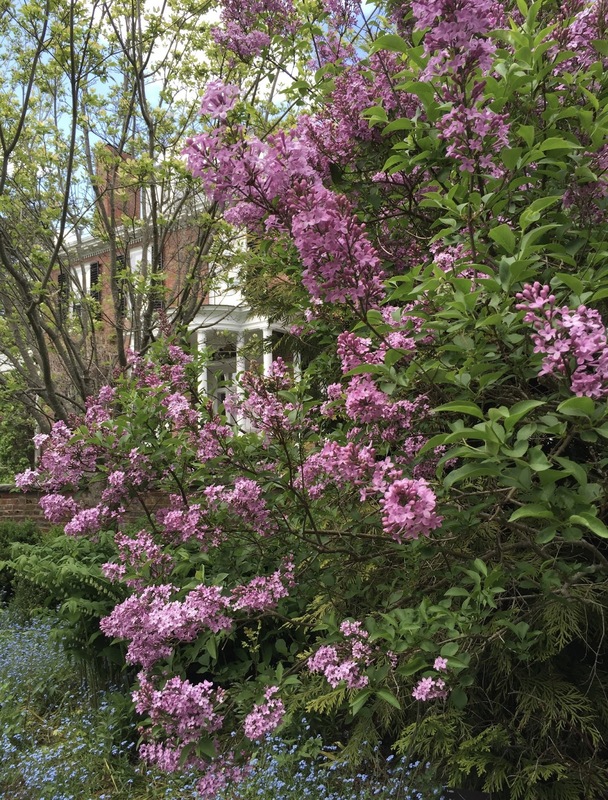 I liked the way the lilacs looked with the house in the background. (Long Hill Gardens, also known as Sedgwick Gardens, was once a private estate, but is now open to the public.) Those little blue flowers are forget-me-nots, blooming all around Long Hill this time of year. The first time I saw them, I thought I was dreaming. 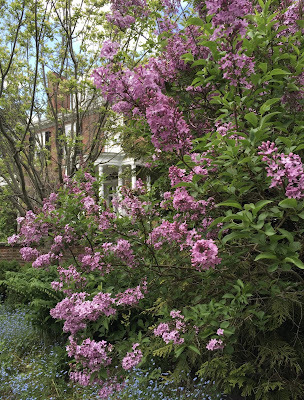 This is another photo from our May 17th walk at Long Hill Gardens, here in Beverly, MA. (I edited it tonight to get this composition.) 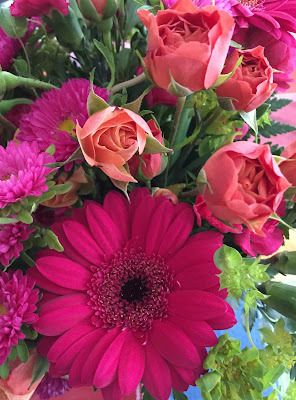 We had extended cool weather this spring with a sudden warm-up; I had been told that at Long Hill Gardens, everything was blooming at once, and it's true! 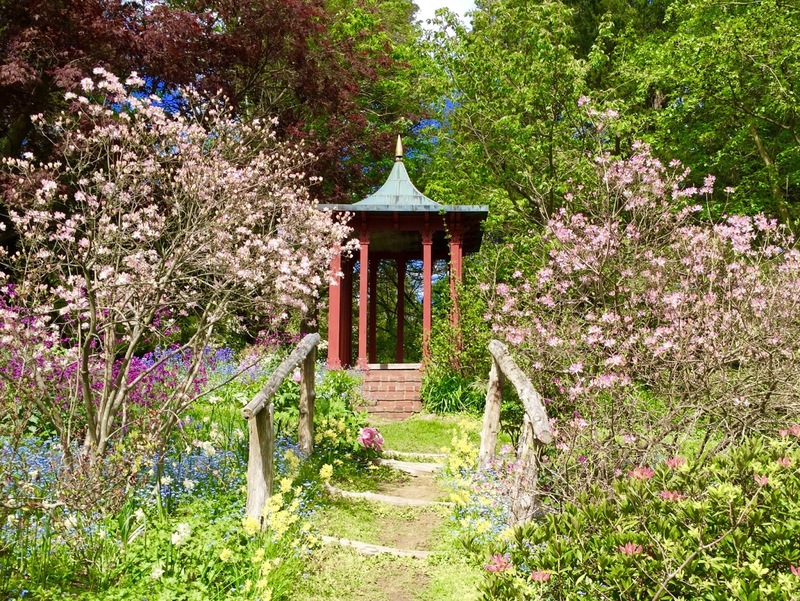 This is the path to the little red pergola in the gardens, and you can see magnolia trees, azalea, peonies, forget-me-nots, rhododendron, and daffodils. I suppose I have taken too many pictures of this little landmark, but like Boston's Zakim Bridge, I never get tired of it. Here's another photo of lilacs from a May 17th trip to Long Hill Gardens. I edited this photo today; I cropped the image and then did a little bit of retouching. 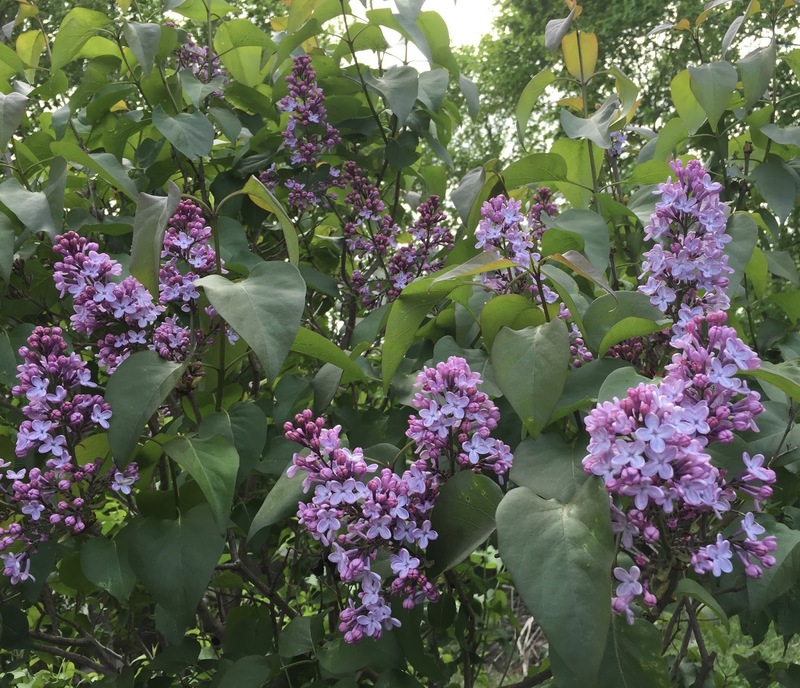 The smell of lilacs takes me right back to the house I grew up in; with a big lilac bush on the lawn. 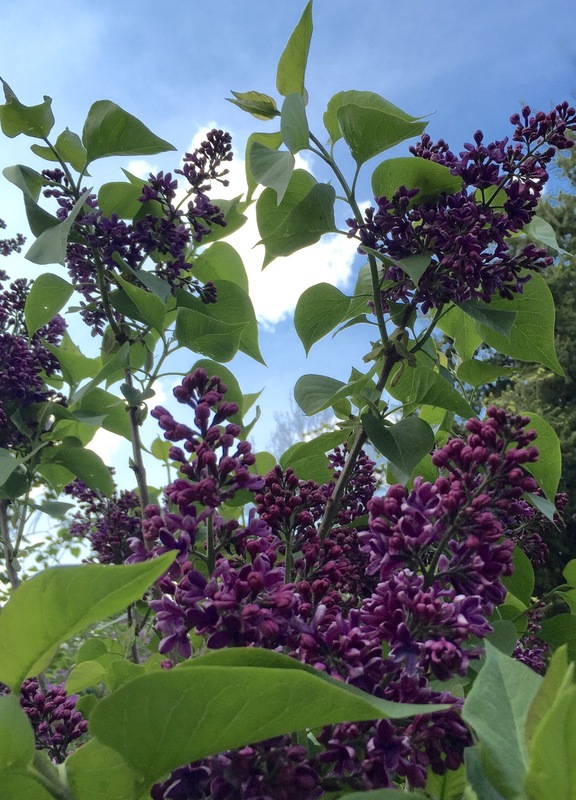 I like to get very close to the lilacs so I can breathe in their perfume. And then I look up. I can never decide whether I prefer the colors of the buds or the blossoms. In this picture, there are both. You can decide. Here north of Boston, warm weather arrived suddenly (and sporadically) over the past few weeks. We took a couple of walks at Long Hill Gardens (here in Beverly, MA), where everything was blooming all at once. I took a lot of pictures and have a backlog of photos to edit. I decided to get started; this is one of the photos I edited tonight. This was taken back on May 17, during a late afternoon walk. One of the reasons I love to go to Long Hill this time of year is that there are lilacs in bloom, lining the main road. This is the third of three little paintings that I worked on a few days ago. I am painting for a group show of postcard-sized art works. 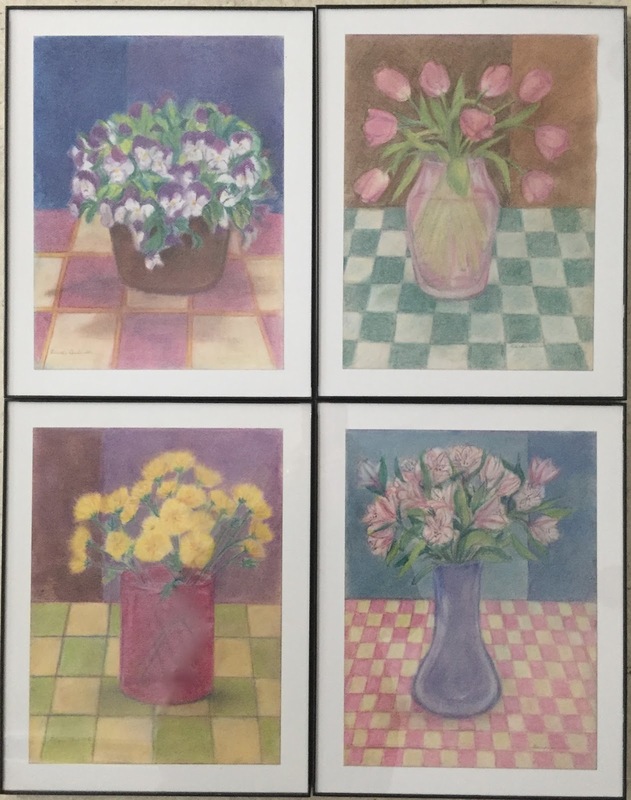 I used postcards made of watercolor paper; the paintings are done with acrylic paint used as water media. Although these paintings are unusually small, they are part of my "Mountain Daydreams" series, landscapes painted from my imagination and my memories of the Rocky Mountains in Colorado, where I was born and raised. Here is the second of three small paintings from yesterday. These are for a special show of postcard-sized art. 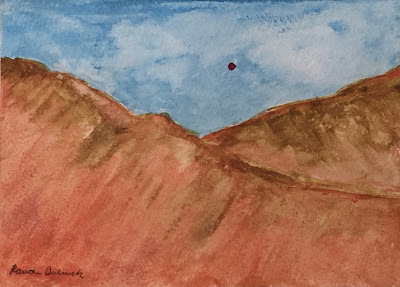 So this is a 5 x 7" postcard made of watercolor paper. This is done with acrylic paint used as water media. 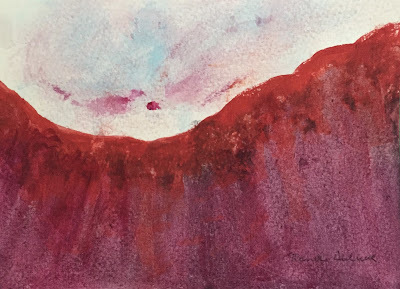 I paint the mountains from imagination and memories of the Rocky Mountains in my home state of Colorado. I painted some small landscapes this morning, and this is the first of three. I am painting these with a special show in mind, a group show of postcard-sized pieces at Galatea Gallery in July. 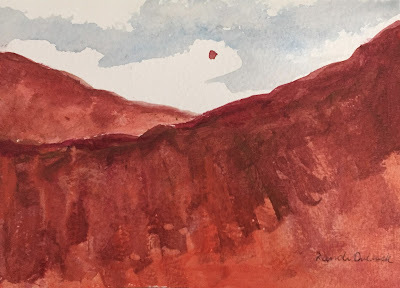 So all of the paintings from this morning are small, 5 x 7 inches, done on watercolor paper postcards with acrylic paint. These landscapes are all part of my "mountain daydream" series, painted from imagination and memories of the Colorado Rocky Mountains. 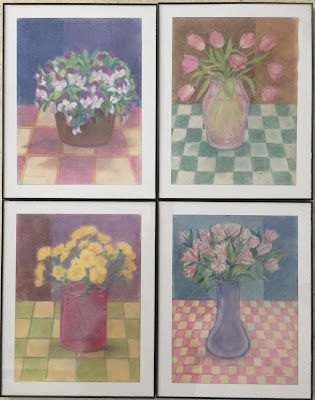 Yesterday I was up early and decided to frame my four pastel drawings for the Porter Mill Challenge. (Porter Mill is the name of our studio building and the challenge was to create one piece of art each week for four weeks.) It felt great to get these framed. I wanted to make sure they would be ready; drop-off for the show is just a few days away. It was fun to see how they looked together. I tried out different ways of arranging the four drawings. I am partial to this one. I took some photos, even though i was getting some reflections from the glass. I have also been painting for a show this summer at Galatea Fine Arts (http://galateafineart.com). I am going to show my mountain landscapes. These are done with acrylic paint used as water media. I paint them from my imagination, but I am also drawing from memories of the Rocky Mountains in my home state of Colorado. 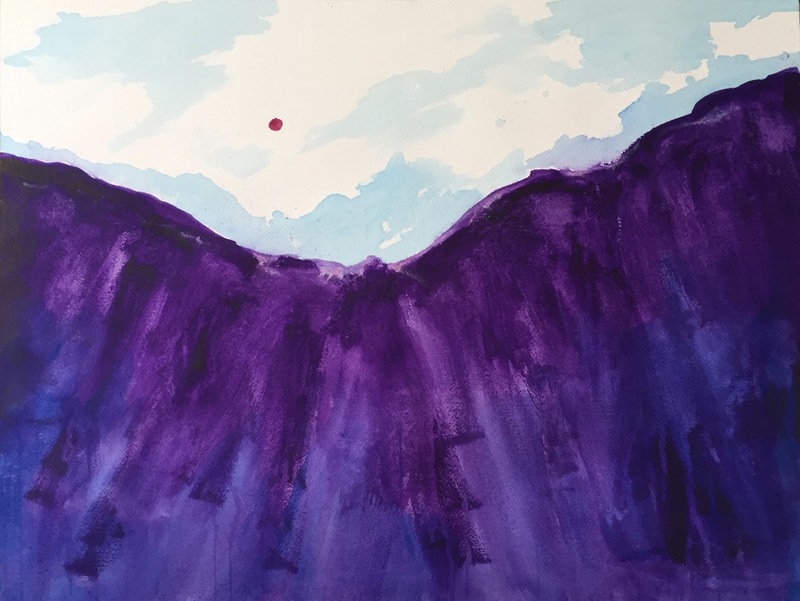 This one is called "Clouds Over Purple Mountains" and I sent a photo of it off to be used for publicity for the show. I posted the original version of this little drawing on January 30, 2016. 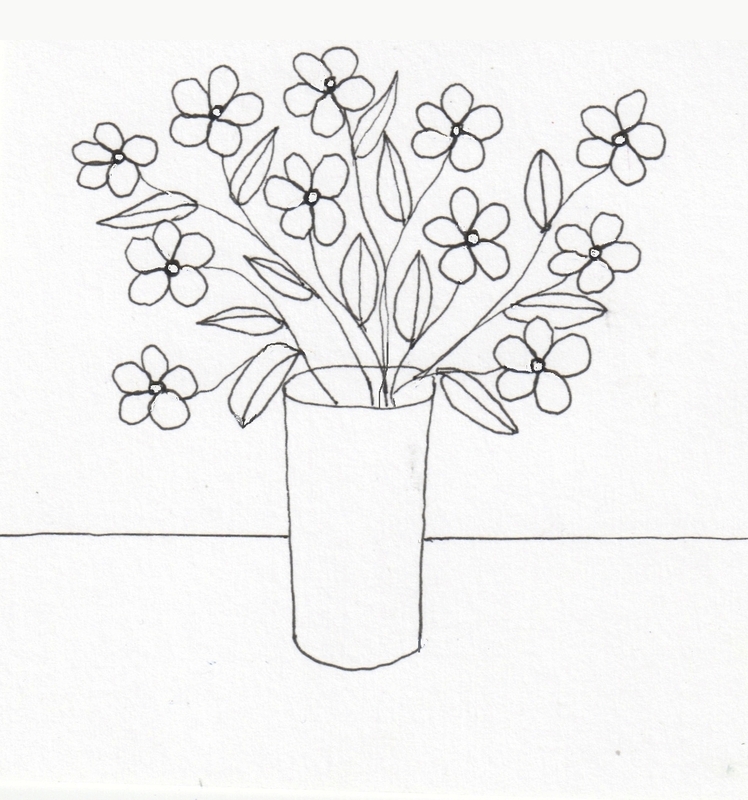 I drew this with fine-line sharpie on a piece of paper that was about 4 inches square. 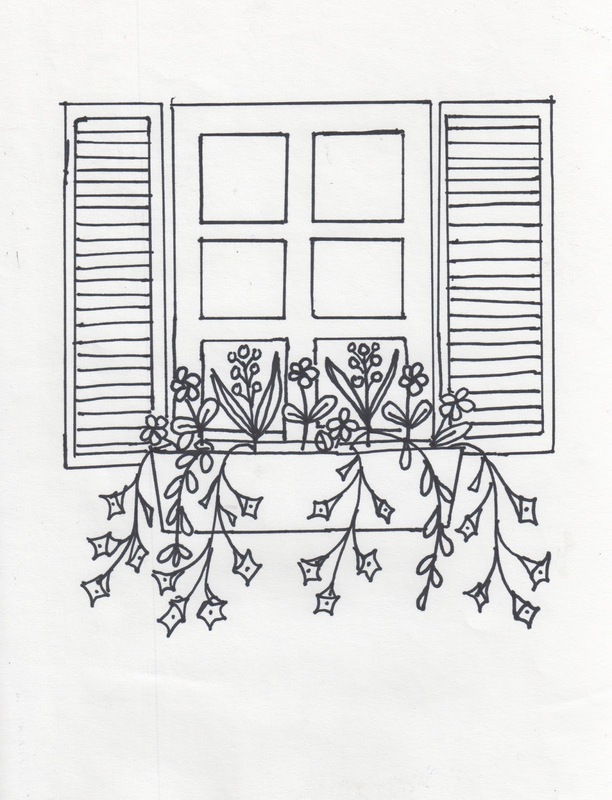 The Wicked Art Bar, located at Porter Mill Galleries, has asked for coloring book pages from local artists, and i decided to my drawing as one of my submissions. But first I had to clean it up. I scanned the drawing into the computer and then used Painter's digital pastel and cut-and-paste to do some basic cleanup. I also changed the center of some the flowers from black to white, creating additional areas to color. 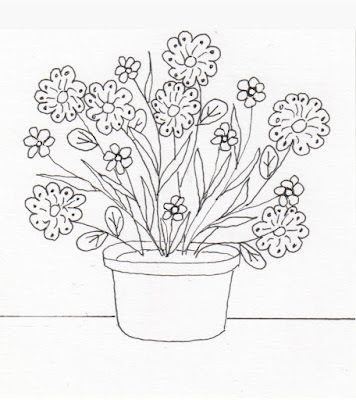 This is a pen and ink drawing that I edited yesterday to adapt it for use as a coloring book page. 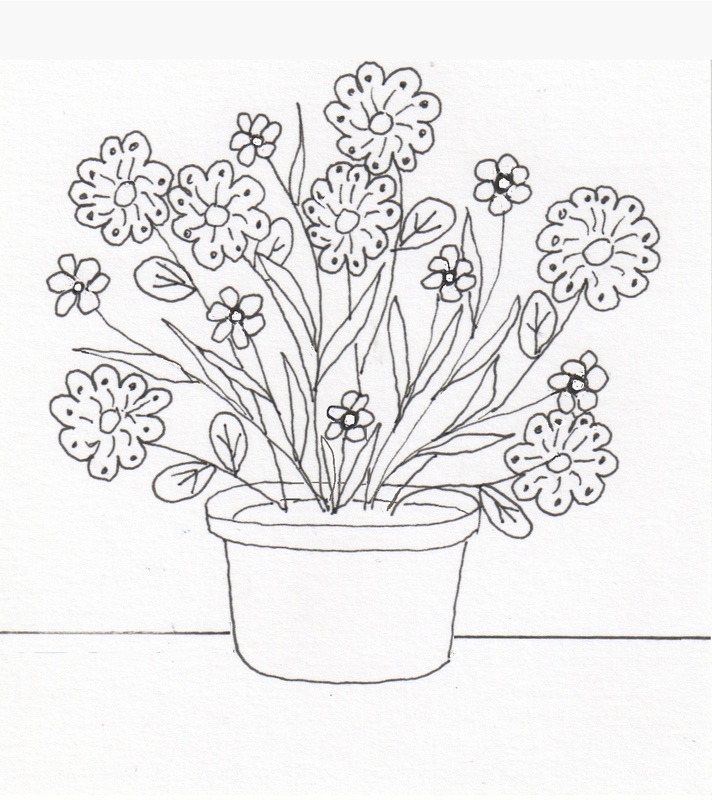 The original version was done with a fine-line Sharpie on a piece of paper that was about 4 x 4 inches. (You can see the original version posted here on February 1, 2016.) To get this image ready, I transferred the image into Painter where I used cut-and-paste and digital pastel to clean it up. I also tried to close up any areas that were "open" so it would work as a coloring book page. 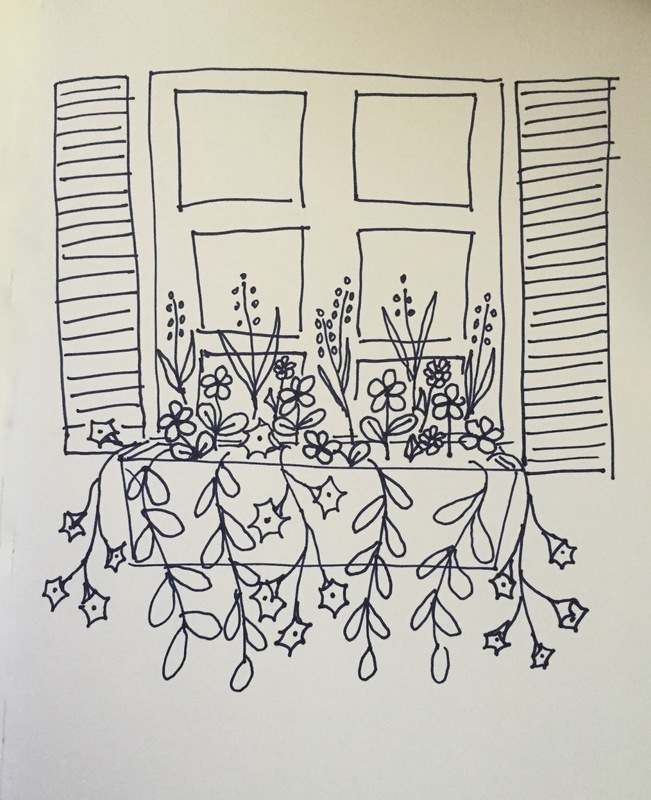 Also, in the original drawings, the daisies had black centers, but I changed them to white to create more areas to color. Then I enlarged the image and printed in as a pdf. 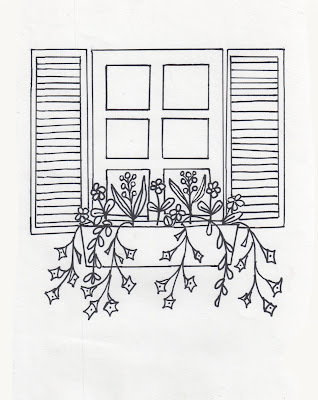 Here is the window box drawing I have been working on. I used Painter to clean up my rough drawing (posted here yesterday). 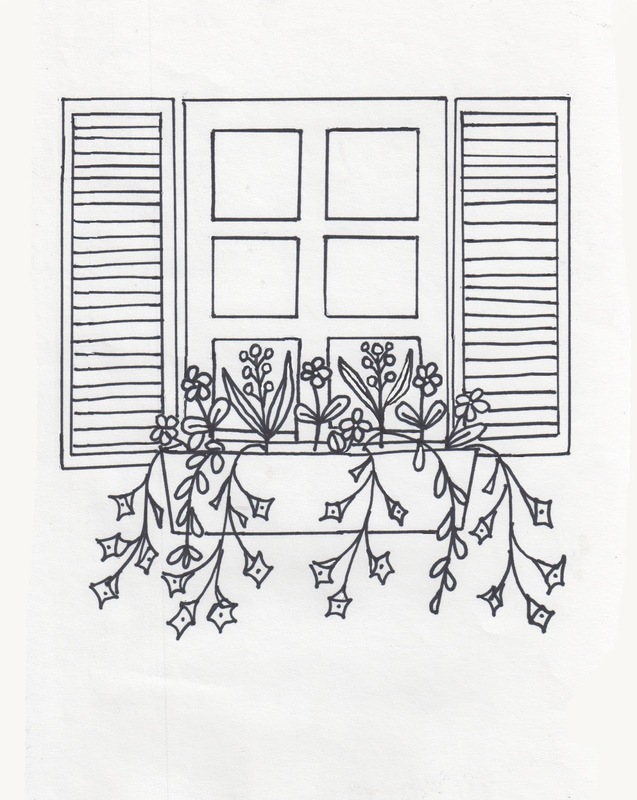 I evened out the size of the shutters and straightened out some lines with some cut-and-paste. And then i did a lot of close work digital pastel to clean up stray lines and correct mistakes. This morning I sent this off, along with two other drawings, to The Wicked Art Bar to be included in their coloring book. About a month ago, I said I would contribute some pages to a coloring book being put together by the Wicked Art Bar, located at Porter Mill Studios. I am working on this drawing that purpose. * I posted a rough sketch yesterday. This morning, I drew three versions and this is the best one. It is still rough, but this morning I got it to the point that it will be possible to clean up digitally. I have already cleaned it up late this afternoon; it cleaned up will and I will post the finished version tomorrow. Lately, it seems like all my projects are taking longer than expected, but I am still going to try get a some drawings done this week, for possible inclusion in a coloring book. A few days ago. I made a list of ideas. Time was short today, so I picked one of my ideas and did this quick sketch. 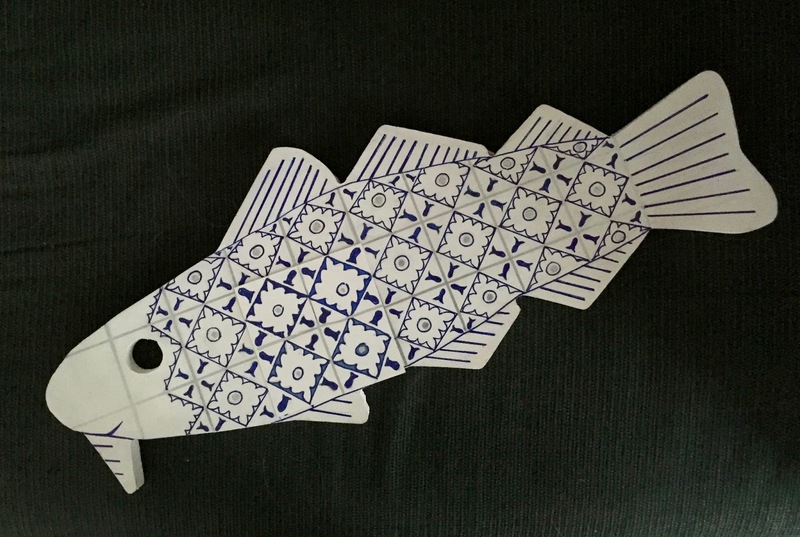 Here's my codfish, all finished. On Friday, I delivered her to Marblehead. Soon she will be on display in downtown Marblehead and then auctioned off to benefit the Marblehead Arts Festival. Bye bye, Bela. 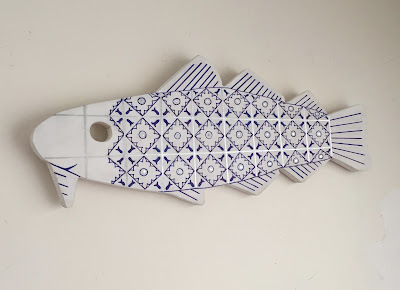 Photo Shoot with "Bela Bacalhau"
I finished this project last Friday, a wooden codfish cutout that I decorated for the Marblehead Arts Festival. (The idea is to auction some fifty codfish decorated by area artists.) 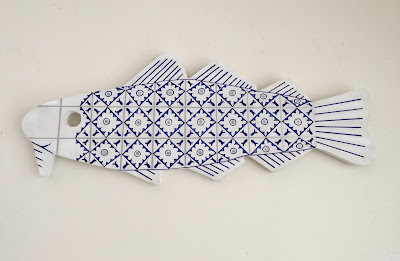 I decorated my codfish with a design inspired by Portuguese tile (azulejos). It was fun to work on this project and I was having trouble letting this one go. (Happens sometimes; that's art biz.) I was starting to pack up Bela to go to Marblehead and decided I wanted to take a couple of pictures first. So here's a quick snapshot of me with "Bela Bacalhau." Photo by Mel Dubnick. On Friday, I was finishing up my codfish project. (Local artists are decorating wooden codfish cutouts, which will be displayed in Marblehead and auctioned to benefit the Marblehead Arts Festival). 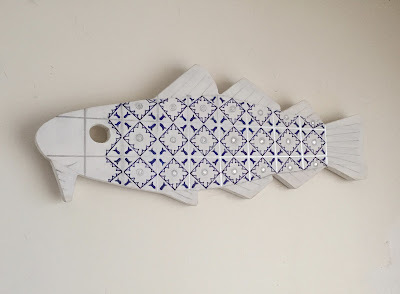 I decided to call my codfish "Bela Bacalhau" because she is decorated with a Portuguese theme of blue and white tiles (azulejos). Well, there was a lot of "detailing" to do to get my design finished, but I also wanted to paint the back and sign it. Here is Bela, just about to be packed up. . . . 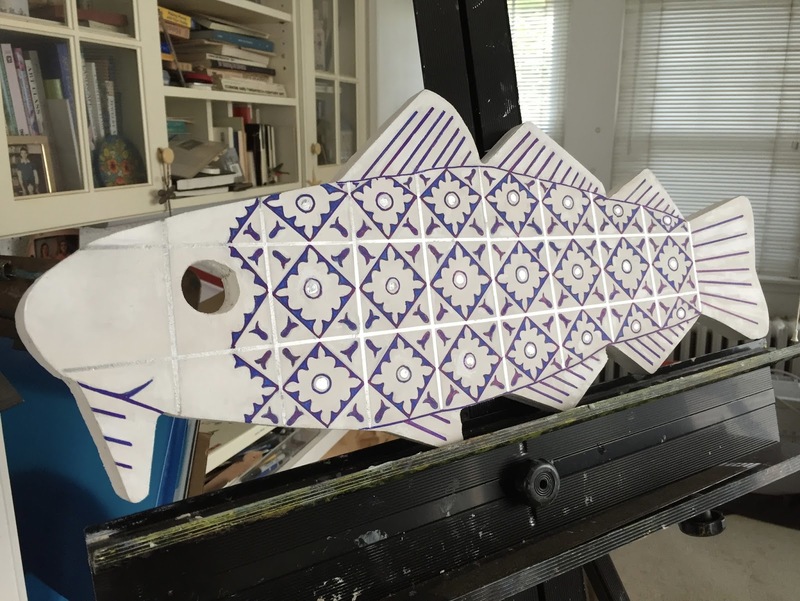 Here is my codfish project, "Bela Bacalhau," on the easel, where she spent the last few days. 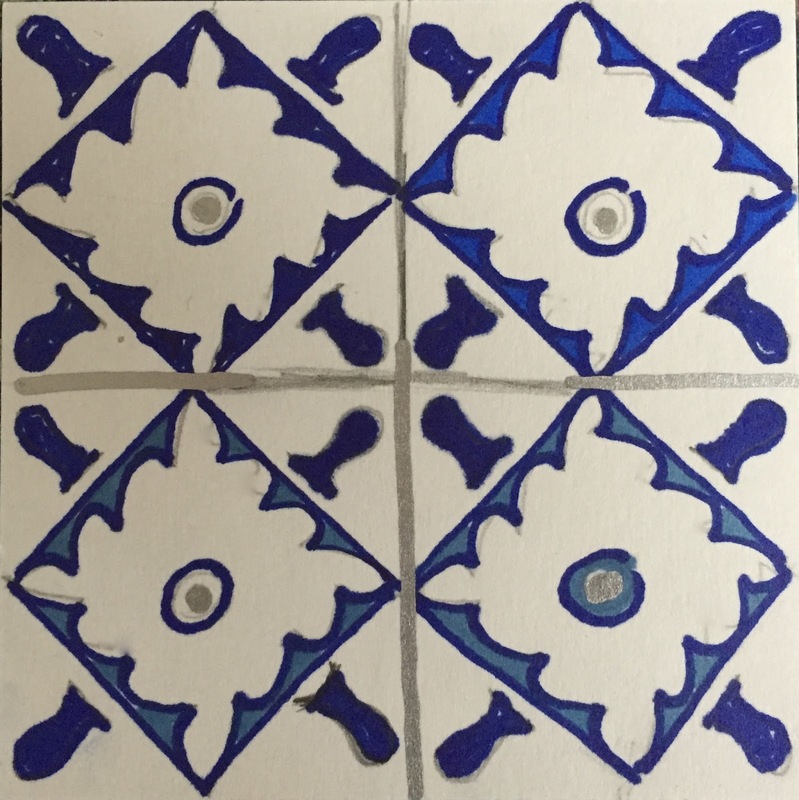 This project is to benefit the Marblehead Arts Festival. 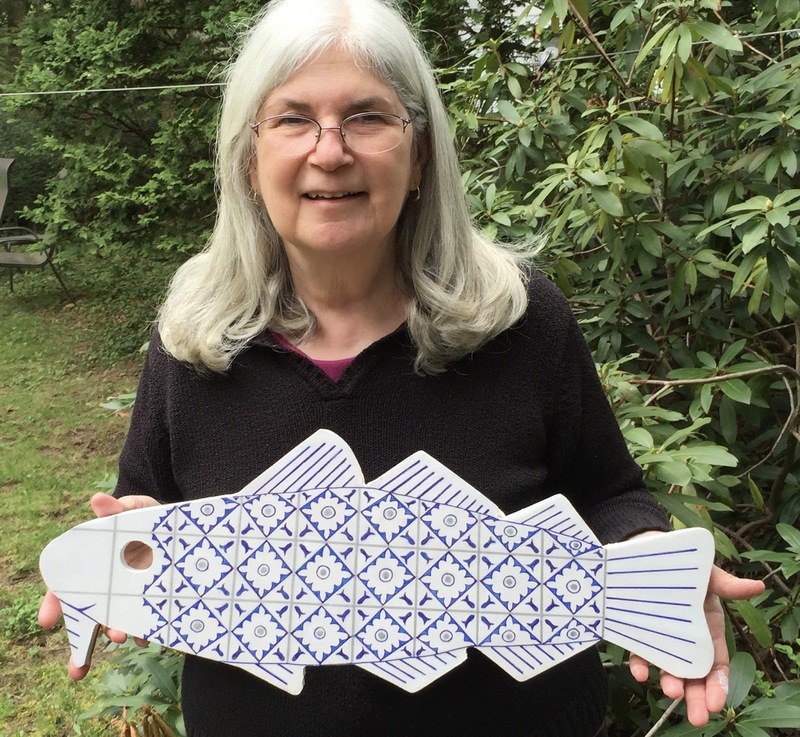 Fifty area artists were given these wooden fish cutouts; their decorated codfish will be auctioned to benefit the arts. I decided to decorate my codfish with a Portuguese theme, a design inspired by Portuguese azulejos, or blue-and-white tile. I have spent the past few days fixing mistakes, cleaning up lines, and painting sides and back, getting ready to take her to Marblehead to drop her off. 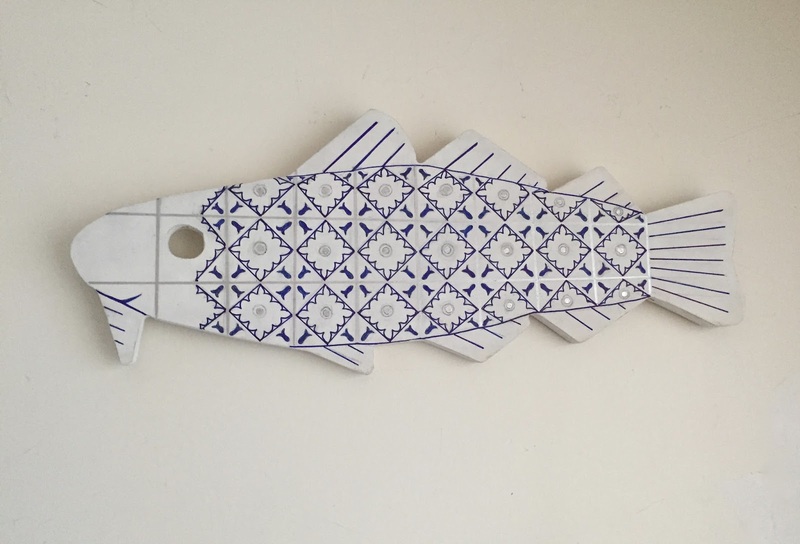 Fifty area artists have been given wooden codfish cutouts to decorate as part of a fundraiser for the Marblehead Arts Festival. 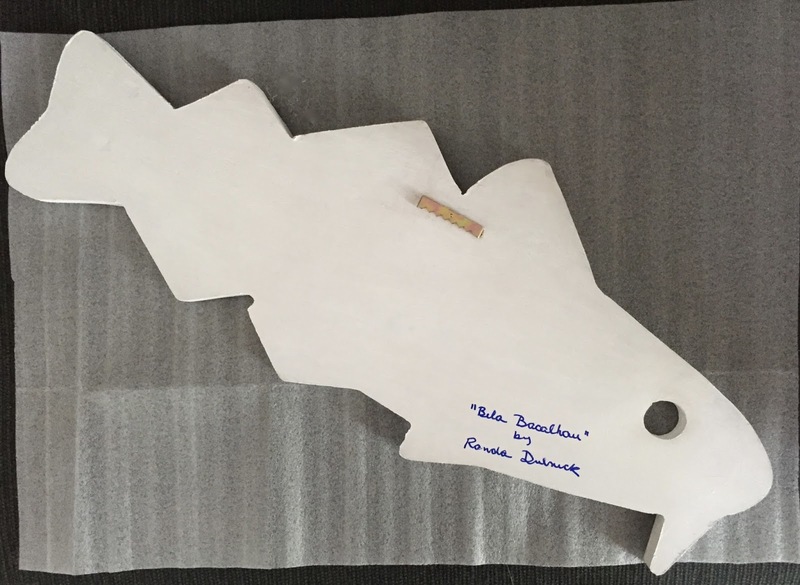 The codfish will be displayed in downtown Marblehead and then auctioned off. This is a closeup of my project. 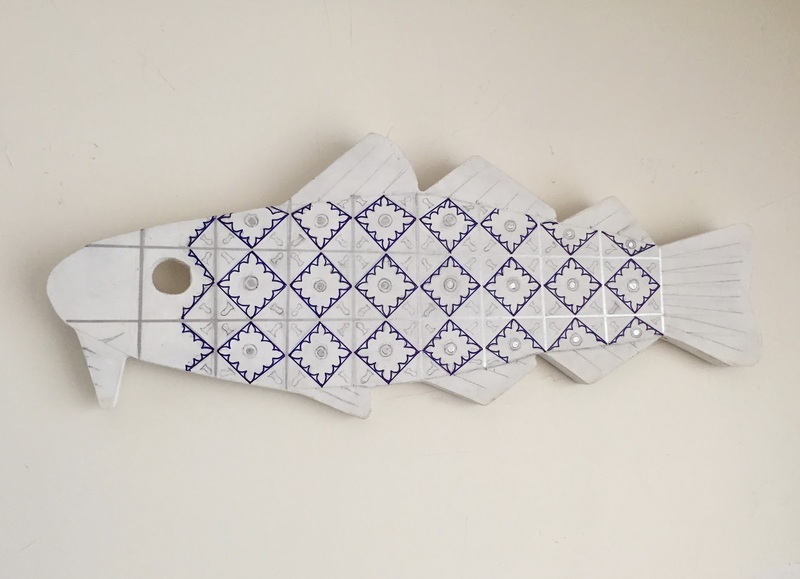 I had the idea of decorating my codfish with a Portuguese theme, maybe because I see codfish (bacalhau) on every menu when I visit Portugal. So I decided to call my fish "Bela BacalhauI" and created a design inspired by blue and white Portuguese tile (azulejos). For the past few days, I have been doing cleanup, fixing mistakes, straightening lines, etc. Of course, it sometimes seemed that every time I fixed a mistake, I created a new one. Well, that's art biz. I was getting close to the deadline for delivery, so I needed to wrap things up. To be continued. I have been working on this project, a wooden cutout of a codfish that I am decorating for the Marblehead Arts Festival. 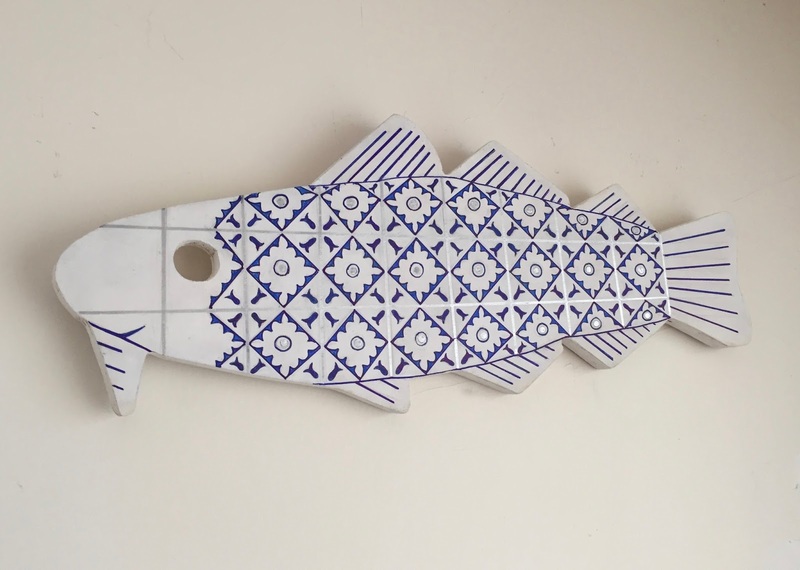 (Fifty decorated codfish are going to be auctioned off.) 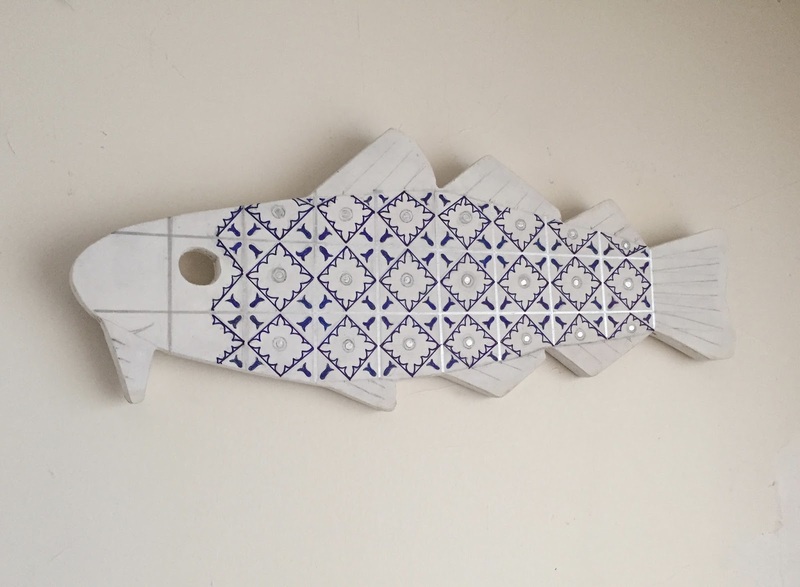 My design is inspired by Portuguese blue and white tiles (azulejos) and I named my project after the most popular fish in Portugal: bacalhau. This is how my project looked after I added blue to the wave design in each square. I was very happy with this change at this point, but there was still a lot of clean-up to do. I wanted Bela to look beautiful! I have been working on decorating a wooden cutout of a codfish for the Marblehead Arts Festival; fifty area artists are decorating fish cutouts that will be displayed in downtown Marblehead and then auctioned off. 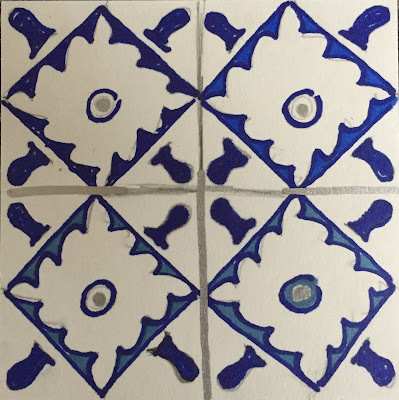 My design is inspired by the blue and white tiles (azulejos) that I see when I visit Portugal. I decided to give my fish a Portuguese name: Bela Bacalhau (Beautiful Codfish). So this is a photo of my codfish project on May 7, with a color tryout sketch positioned on top. Can you see the sketch? At this point, I had already chosen the blue that I would use if I colored in the wave design on the inside of the squares. But I still wasn't sure whether to color the areas in at all, or to leave them white, outlined in blue. So before I started making changes on the wooden cutout, I wanted to get a better idea of how the design would look with those areas colored in. So I put the color tryout sketch right on top of the fish and took a hard look. That really helped, and I decided that i wanted to add color to those areas because I thought it would strengthen the design and would balance the strong blue lines on the fins and tail. To be continued. . . This is a very rough sketch done with fine-line marker on a small piece of paper. 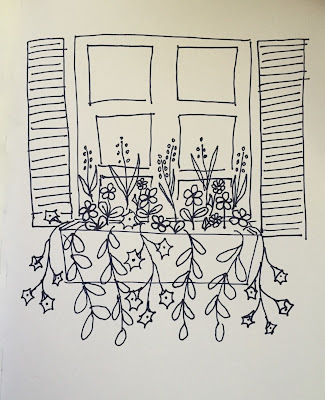 I made this sketch a few days ago to help me make a color choice for the wooden codfish cutout that I am decorating for the Marblehead Arts Festival. 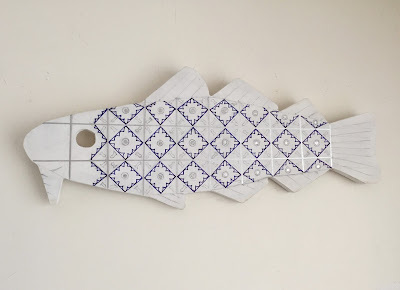 For this project, I created a pattern inspired by Portuguese blue and white tiles (azulejos) and gave my fish a Portuguese name, Bela Bacalhau (beautiful codfish). 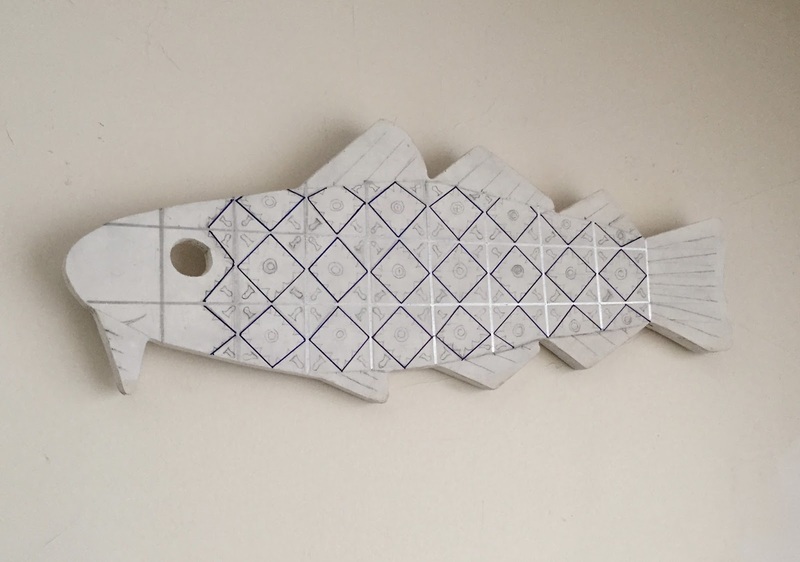 By Friday, I had drawn in the whole design onto the wooden fish with fine-line marker. (See post for May 6, 2016). But I was still trying to decide about the color for the little "wave" patterns inside each square. Should I leave them as is color them in with dark blue, or color them in with a lighter blue? I decided to do a little rough sketch so I could ask innocent bystanders what they thought. (See post for May 9.) I asked family members and friends which square they preferred. What I heard: the two-tone idea is good, but do I want people to perceive the outline or the pattern? That was an interesting question, which led me to a better solution. 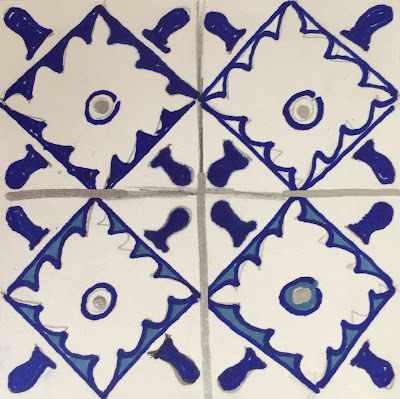 I wanted a blue that was close to the outline color, but perceptibly different. 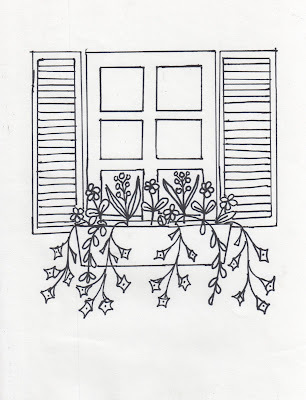 That way, I would create a two-tone effect, the pattern would pop out, and the outline would still show. So I grabbed another Sharpie and filled in the waves in the white square with a bright blue. (See upper right square.) That color seemed right, but I wasn't ready to actually change the pattern on the wooden fish until I did tried one more thing. To be continued. . . . I am finishing up a project for the Marblehead Arts Festival, decorating a wooden cutout of a codfish, to be displayed and then auctioned off. 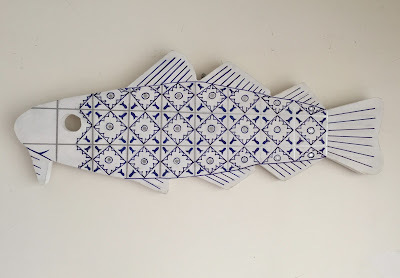 I am decorating my codfish with a design inspired by Portuguese azulejos (blue and white tiles), and I have named my codfish "Bela Bacalhau". A few days ago, I finished drawing in all the design elements (see post for May 6). But I was still thinking hard about adding color to one of the design elements: the "wave" design on the inside of the square. 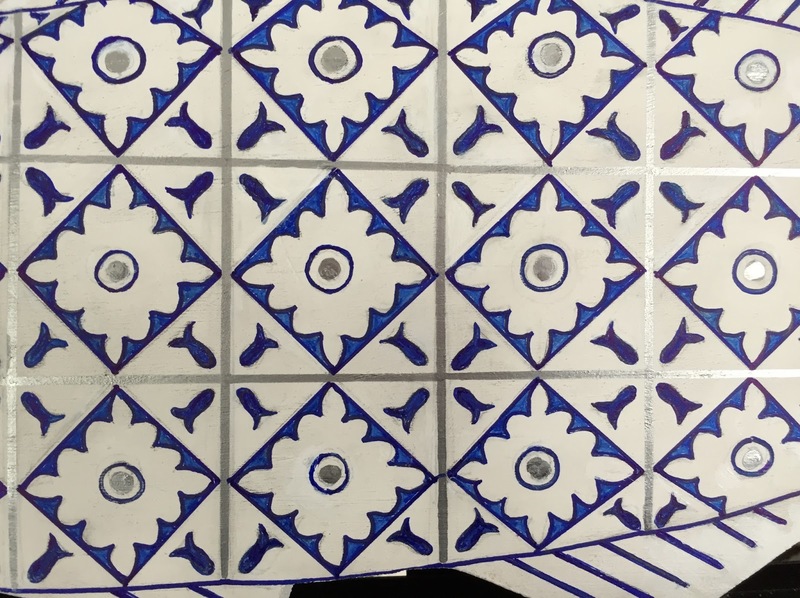 My choices were to leave the design as is (the safest option), to color it in with dark blue to match the outline, or to add a second blue color. I couldn't decide so I decide to do some trial runs. 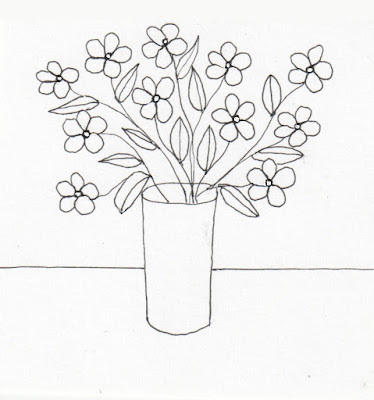 I had already made a rough sketch in pencil on a piece of paper (4" x 4") so the squares were just about "life sized". 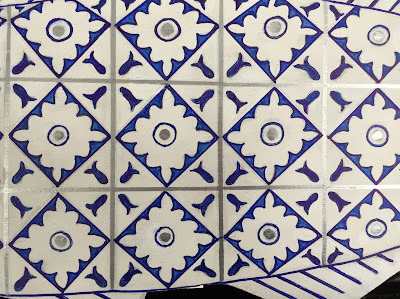 I grabbed my sharpies and quickly outlined the shapes in dark blue. Then I tried out some color variations in the four squares: waves in white, dark blue, and a lighter blue. In one square, I also tried adding color to the circular element. This is a very rough sketch, but it helped me to visualize the problem, and I was able to show this sketch to my beleaguered family members to see which option they preferred. To be continued. A few years ago, my aunt sent me a package of photos of my mom. My aunt took them out of her own album and mailed them to me because she thought I would like them, and I sure do! 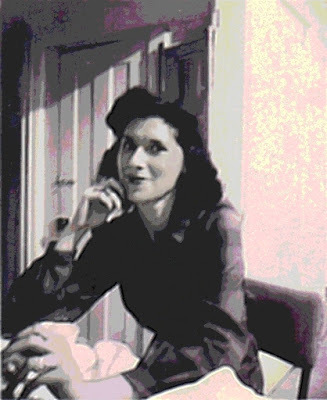 Most of the photos were new to me, images of my mother before she got married. Yesterday I was looking through the packet and found a great picture of her. The handwritten inscription on the back said: "Coffee Time at the Katz Domicile -- R". (My mother's name was Ruth and that sounds like her sense of humor.) I have seen other photos of my mother and my aunt sitting at the kitchen table with a changing cast of characters: soldiers, assorted boyfriends, and even husbands to be, so I think this was during WWII, though the photo is undated. My mom and my aunt used to go to USO dances and met soldiers stationed in Pueblo during the war. Sometimes a soldier got an invitation to come to the house. Apparently the "Katz Domicile" was the place to be! I don't know who took the picture -- maybe my aunt or one of the guests -- but the unknown photographer capture a great picture of my mom's face. So when I saw the snapshot yesterday, I decided to do something with it for Mother's Day. The original snapshot was black and white, and quite small (2 x 3 inches). I loved the photo but there were a couple of things I wanted to fix. The original version also had captured the arm and hip of another person, seen from the back, on the right side of the picture. And of course, my mother was smoking, and I wanted to get rid of that cigarette -- something I was never able to do in real life. So I scanned the image into my computer, did some basic cleanup and cropping with the Mac photo program, and then opened the image in Painter. I used cut-and-paste to cover up the second unknown figure in the photo. And I used digital pastel to draw over that cigarette. I adjusted the focus just a bit, too. I saved that edited version of the snapshot, made a copy, and then added color with digital pastel and color overlay. I know my mom liked purples and pinks and reds, so I used those colors. Then I posterized it hard, which intensifies colors and adds texture. The result looks modern, a bit edgy, and I think my mom would have liked that. Yesterday this beautiful bouquet arrived, an early Mother's Day gift. I love the bright colors, so I took some pictures. This closeup is the best of the photos I took.